William Gerard De Brahm (1718-1799), German by birth, spent the majority of his life working to satisfy the need for British expansion and exploration. After emigrating to the recently-founded colony of Georgia in 1751, De Brahm worked as a cartographer. His skill and attention to detail earned him the rank of Surveyor General in Georgia, and he would soon occupy the same rank for the entire New World, as appointed by the British Board of Trade. De Brahm’s “Map of South Carolina” and “Map of South Carolina and Part of Georgia” provide detailed topography and even expose underwater features, and his writings chronicle everything from the times of the tides to tips for the cultivation of soil. Penned during a hiatus in 1771 from his position as The Surveyor General of the Southern District of North America, he wrote the most popular of these volumes “Report on The General Survey.” The Atlantic Pilot, published in England in 1772, helped increase the British awareness of the coasts and geographical surroundings. Honoring the King’s orders, De Brahm made discoveries and surveyed the seas mapping and recording the safe navigation for future shipping. Later in life, De Brahm became disenchanted with the exploitation of the land and the native people caused by imperialism. His writing took on a task more mystical in strange relationship with nature. He sought to explain the unexplored nature of time and space, much as he had explained the terrain of the largely unexplored Florida. This penchant for esoteric musings colors the latter half of his life. Overall, De Brahm is remembered for his skills as a cartographer and knowledge of nature, as well as his later eccentric writings. Coomes, Charles S. “The De Brahm Medals: An Eccentric Geographer Remembers his Grandchildren.” El Escribano 16 (1979): 77–90. De Vorsey, Louis, Jr. “A Colorful Resident of British Saint Augustine: William Gerard De Brahm.” El Escribano 12 (Jan. 1975): 1–24. Mowat, Charles L. “That Odd Being De Brahm.” Florida Historical Quarterly 29 (April 1942): 323–45. De Brahm, John William Gerard. Report of the General Survey in the Southern District of North America. Ed. Louis De Vorsey, Jr. Columbia: U South Carolina P, 1971. _____________. The Atlantic Pilot. Ed. Louis De Vorsey, Jr. Gainesville: U P of Florida, 1974. 9th That all Europeans (which incline to cultivate this Province) may proceed like unto the Americans and Boldness and reasonably account before hand for their Success, not meeting with those Disappointments obvious hitherto for want of Experience or Information: The most ingenious of them are advise to enquire into the Nature of their own Climate, in which they are born and educated’ the Power of the Sun by Inflection and Reflection; their Nourishment and Medicines accustomed to; they are to acquire Information of the Climate, and Power of the Sun, Mode of Living and Culture of the Climate they intend to move to; they are to collect such Plants and Seeds as they are sure will be worth transplanting, either for Refreshment of Life, preservation or Recover of Health, or for Market and Profit; they are (if able) to lay in good Stock of Furnitures, Garments, Provisions and Medicines, such as they have been used to, and which they have no Probability to meet with in a New Province; thereby to do Justice to their Constitution, private Interest, and to the general Good of Society. I come now to the useful Animal, among which the Bear deserves the Preference, for its Meat is by many relished above Pork, his Fat is rather an Oil, and sweet that of Almonds, and his Skin makes the best under Bed in Summer both in Houses, and in the Woods, for it is cold and gives no Passage to the Moisture of the Earth to prejudice those Travelers, who are obliged to camp in the Forrests; makes also a good Cover over the Pack-Horses to keep the Baggage dry in rainy Seasons, and in a Temperature against the Heat of the Sun. Your Lordship, ever attentive to the welfare of his Majesty’s American subjects, and ready on all occasions to shew your zeal to support their interests, and render them opulent and prosperous, cannot but sympathize with the many unfortunate adventurers who are so deeply and frequently distressed by the calamities which every year befall vessels navigating on the Western Atlantic Coast, especially in the New Bahama Channel, and in the mouth of the Gulf of Mexico, opposite the Island of Cuba, on the Martiere rocky reefs and sand-banks. Your Lordship’s great vigilance and humanity are clearly evinced by his Majesty’s orders, (which the execution of which I was honoured by your Lordship in 1764) for making discoveries with regard to those seas, and for carrying on a regular survey of the countries to which they set bounds: in promoting which necessary and important undertaking your Lordship’s prevailing inclination (that of doing good) appears to fully to admit a doubt. Permit me to add, my Lord that this motive animated me likewise in the performance of that duty I entered upon in obedience to his Majesty’s command, in gratitude to your Lordship for the confidence reposed in me, and with a real affection for my fellow subjects. From the materials which there expeditions afforded me, and which I have had the honour to lay before your Lordship, I have since (with your Lordship permission) compiled this little Treatise, which I have called the Atlantic Pilot, as being calculated for the safer conduct of ships in their navigation from the Gulf of Mexico along Cuba and the Martieres, through the New Bahama Channel, to the northern part of his Majesty’s dominions upon the continent of North America, and from thence to Europe. William Gerard de Brahm, Esq. from the year 1765, to the year 1771. FROM THE LATE DISCOVERIES BY THE ATLANTIC PILOT. 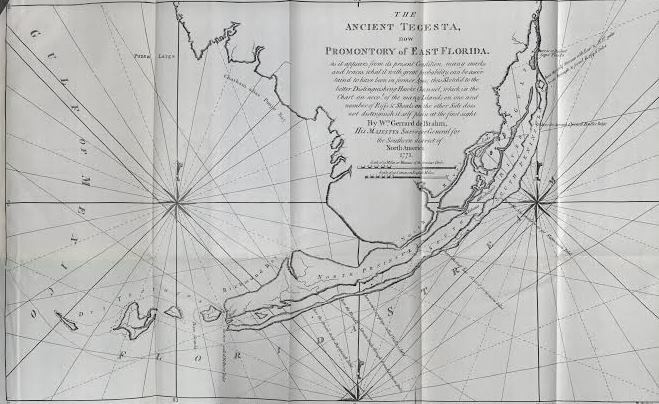 Cape Florida has not, in appearance to transient navigators, the characteristic of one of the southern capes of the promontory of East Florida, (in former time scarcely known to the world, gave by its bare name and existence, unless, in parts, by those who in their navigation near it become unfortunate by suffering ship wreck.) I should not contend with such as refuse or hesitate to admit it among the number of capes, because it almost joins (when discovered from the southward) a ridge of islands on it’s south, with fierce less visible distinction than it joins the continent to its north; and indeed it has, in all probability, been in former ages part of the main. This, by the plan I have sketched of its probable antient figure, drawn from the conclusions obtained by judging of its present shape and condition, I endeavour to shew more fully, however, by cause of the last bend or course of the Florida steam at this place, where it enters after several changes in its course, the New Bahama channel with N.b.E. direction; by cause of the inlet being here made by force of the said stream into Hawke channel; (which channel runs from latitude 25 35′, contains I 43′ difference of longitude, and I 10′ difference of latitude, and has its bed between the Martier reefs and shoals on its south, and the Martier islands to its north;) also by cause of this place being at present the south end of the western Atlantic coast, and the beginning of the northern main forming the gulf of Mexico, which both meet here in an angle of 150 degrees; and like wise because most vessels departing from the Havannah on Cuba, or Panna Matance, is properly laid up, discover generally this place first, which is their criterion of having passed the Martier reefs; and they may hence with safety continue standing entrance of the New Bahama channels and take from thence the benefit of the Florida Stream through the said channel into Atlantic ocean, for all which reasons I think myself under the obligation to rank this place among the capes, and particularize it as such in my General Hydrogeographical, as also in my Special Hydrographical Maps. Cape Florida is situated in north latitude 25 degrees 42′ 42″; and in the west longitude, from the London meridian, 81 degrees 00′ 19″. The sun’s and magnetical amplitude differ here with 6 degrees east variation of the compass. All these parts, at present distinguished by the appellations of Cape Florida, Martier Islands, Martier Shoals, and the Martier Reefs, do appear to have been in times past contiguous, forming two peninsulas on the south end of that promontory, fortified as it were against the Florida stream by broken islands, which contain near forty miles in longitude, and twelve miles in latitude, know this day by the name of Dry Tortugas; and by a reef, out of sight of any land west of these islands, known by the name of Tortuga Bank. Of the southernmost peninsula, whose isthmus now constitutes Cape Florida, there remains only the trace among the shoals and reefs. Of the northern peninsula, whose isthmus exists west of Sandwich Gulf, there are extant many valuable islands, besides the tract of its whole shape. Between these two peninsulas and the main are, to this day, parts of one river, called Grant’s Lake, and the whole channel of another, called Hawke Channel, both issuing, viz. the former from the northward of (the formerly called Island, now Peninsula) Larga; and the other out of Sandwich Gulf: and both with a parallel course, (viz. Grant’s Lake, after sweeping the north beach of the southern peninsula, and south shore of the main; and Hawke Channel, after watering the south of the northern and the north shore of the southern peninsulas) emptied themselves, to the north south of Dry Tortugas, into the gulf of Mexico, and its stream. The islands still in being, as remnants of the northern peninsula, are many, and go by the general name of Martier Islands, or commonly the Keys, whose original Spanish names are not all known, or which never have been named: of such the remarkable and nameless shall now be distinguished with the proper names, and run thus, viz. from north eastward to south-westward, Biskaino, Oswald, Laurence, Los Paradizos, Soldiers, Knox, Pollock, Powernall, Elliot, Jeyns, Fox, Stephens, Bull, Wright, Matacombe la Mosa, Boys, Matance, (signifying Massacre, from an unhappy French crew, wrecked on Matacombe, and said to have been massacred thereon by the Caloosa Indians) Jenkinson, Dyions, Townshends, Coopers, Bradshaw, Matacombe la Viega, Vivera, Reynolds, Ellis, Vacas, Newcastle, Rice, Jenning, Roberson, Roberts, Littleton, Glen, Oglethorp, Edwards, Fitzherbert, Hueso, and the Tortugas. Hueso is the south point of the former northern peninsula, as the shoal Sombreros, with its barren sand-hills, is the south of the former peninsula. Between Hueso and the Tortugas continues the former creek, in very good condition, situated in latitude 24 degrees 25′ and in 82 degrees 53′ 29″ west longitude from the meridian of London, where the magnetical differs 6 degrees 25 east from the solar amplitude” it is known by the name of Egmonth Channel, and affords a very good passage to and from Pensacola and places contiguous. An E.N.E moon makes there high water: the rise and fall of flood and ebb is 3 1/2 feet neap tide, and 6 1/2 feet at full and change: the best water lies on the east side of the channel, which is five miles in length bears S.S.E and N.N.W and where narrowest, is a quarter of a mile wide: it floods in this channel at times from south to north five hours, and the ebbs seven; at other times it floods seen hours moderately, so that a vessel with a leading wind may easily stem its current: but it ebbs give hours from north to south, with precipitation, across the Hueso banks, and sets over upon the Tortuga shoal, so that a vessel cannot with a landing wind stand against it, without danger of being set on shore on the Tortuga bank. The soundings in this channel run between 36 3/10 and 16 1/2 feet high water, neap tide, and from 39 3/10 to 19 1/2 high water spring tide, upon white land on the south end, which lasts for about two miles; then upon rocks and sand for near two miles more; and end upon white marl, from which they fall upon quicksand to the north of the said channel, and increase in Richmond Bay on sandy bottom. The great weight of the sea inclosed within the vast extent of the Mexican gulf is set in agitation by the trade-winds, as is generally agreed; whereby the famous Florida stream is supposed to be effected, and thence called Gulf Stream; by which nature conduces both to the health and conveniencey of that region: but this stream is in reality carried into the gulf of Mexico in there trade-winds, and therein circulates at large; but at the place of is issue, anxiously compressed by the islands Cuba and Bahamas on one side, and the promontory on the other, is constrained to curb its current suddenly and often, in order to take its vent on the east side of the said promontory at Cape Florida, though the New Bahama channel into the Atlantic ocean, with N.b.E. direction, which direction at Cape Canaveral, in latitude 28 degrees 20′ 50″, it exchanges with a N.N.E. Charles-Town, from when it runs with a N.E. turn to latitude 42 degrees and 68 west longitude from London, then E.b.N. to the bank of Newfoundland, and unites about 40 degrees west longitude from London, with currents issuing out of St. Lawrence’s Gulf, Baffin’s Bay, and Duson’s Straits, with which it takes a S.E. departure towards the western islands, probably joins the current setting out of the strait of Gibraltar, and proceeds as far as the coast of Africa, until it falls in with the trade-winds again, and returns, after its rotation in the ocean, to the gulf of Mexico- North and N.E. as also east winds press the Florida stream home to the Atlantic coast, and confine it in a very narrow channel at which times it runs like a torrent. S.E. and south winds give less motion to the natural current to the stream, because it then runs in its natural channel, is wider, as also distant from the shore, on which distance part of the stream returns by an eddy southwardly, S.W. west and into the ocean, consequently beyond its natural eastern boundary; by which its natural eastern boundary; by which its current is but moderate, having that motion diminished, which is caused by the pressure it receives in its confinement between the islands Cuba, Bahamas, and the promontory. For particulars, reference may be had to the Hydrographical Map of the Atlantic Ocean between the English Channel and North America, terminating at the Martiers; where the stream, according to the interceptions of winds contrary to its assumed regular course, and by reason of its sudden changes in its procession on the promontory from S. to S.E. to E. to N.E. and at Cape Florida to N.N.E. and in the New Bahama Channel to N.b.E. strikes more or less force on the manner, that the continent has been, and is to this day, object to yield its limits foot by foot to the stream. Myself, and people employed by me in this service, have these three years observed many places, where fresh encroachments appear to this effect: even the vast quantity of scattered large old trees, washed out with their roots on all shores of the islands, and out in the shallow sea between the islands and main, testify that they lay on the spot of the former continent and peninsulas, where their genus and species formally flourished; but none of us, on the many places we frequented, have met with a spot, where the continent has taken possession of limits deserted by the stream There are testimonies, if not evident proofs, that the stream, not satisfied with its confined sudden turns, endeavors to extend; but does not give up any of its acquisitions, or exchange old possessions in lieu, as seas and rivers are well known to do in all parts of the known world. This encroachment of the stream has torn there naturally low peninsula and the continent, at times of inundations, (cased by the great gales and hurricanes, aggravated by the accompanying of moon’s full and change) into so many subdivisions as are in being under the different names and appellations mentioned above. In the month of September, 1769, happened such an inundation, which then covered the very tops of the highest trees on the peninsula Larga, and the islands Fox, Stephens, Jenyns, and Elliot, with three feet water, experienced to the great damage of the Litbury snow, John Lo-rain master, who, by the N.W. current of the stream, caused by a N.E gale, was forced over the reef in a shallow sea, bulged, and coming to anchor in Hawke channel over the south end of Elliot, found himself next day on shore, with his anchor among the trees on the sand island. The high Martier islands are grounded upon rocks, some grey, some white, and some black and hard as flint: and the low, viz. mangrove islands, are founded on coral rocks, all covered with a rich, but wet foil. The high islands are covered in places with sand, on which little or nothing grows; in other parts they have a stratum of bluish marl, on which torch, madeira, lignum vitae, iron wood, sapodilla, manchenill, wild cinnamon, gum elemi, papa papajos, the white, red, and black mangrove, cotton and grape tree, grape vine, the hicoco plum, the aloes, opunita, and squilla, flourish in great abundance, in the most agreeable climate, whole summer heat is temperated by the trade-winds, and where the sun’s greatest distance permits the termoscope, as I have experienced between latitude 24 degrees and 25 degrees at Christmas day, as also before and after to rise up as far as 82 degrees. On some of these islands are ponds and wells, in rocks of exceeding good fresh water; of which notice is taken in the General Map. A species of pawns, (shrimps) growing to the weight of five pounds a piece, live in great numbers in the holes of coral rocks, on the mangrove islands: these shrimp are by the West-Indians improperly called lobsters, although they have not the two claws, as lobsters: they are beautifully spotted with red, yellow, blue, green, grey, and a little black; but they all change into one red colour by boiling : besides them are tortoise in great quantity viz. the loggerhead, hawk-bill, and green; as also Jew-fish, snappers, gruppers, gorans, porgus, angel-fish, bone-fish, the bass and hippocampus, near and about the islands; and farther off, in or near the stream, are king-fish, dolphins, bonetoes, albicores, cavallos, baracutas, red hog-fish, Spanish mackarels, old wives, turbots, sucking-fish, bats (commonly called devil-fish) sharks, and bottle nose porpoises. None of the islands is inhabited by any of the human species, but constantly visited by the English from New Providence, and Spaniards from Cuba, for the sake of wrecks, madeira wood, tortoise, shrimps, fish, and birds: of the latter a variety exist on the islands and about Cape Sable, amongst which is peculiarly a large red bird, which measures six feet from the toe to its bill’s end, (which is crooked, and has its maxillary motion on its upper part, as on that of a parrot) and is called flamingo, besides small deer, bears, raccoons, and squirrels. The shoals, especially Sombreros, south of Fitzherbert, and the Shoal Loup, (thus called, from the Loup man of war being loft thereon) south of Roberts, which shoals border upon the Florida stream, distinguishing themselves by showing their sand-hills above water (visible at four and five miles distance) evidently appear to be the remnant of the southern peninsula torn first into islands, which, deprived of their natural products, inhabitants and rich soil, retain only at this time their barren sand-cover over their rocky foundation; from which I reasonably conclude, that the rocky reefs are the number of those islands formed by force of the stream out of the southern peninsula above mentioned, but washed clean of all that the violence of the stream could move thereon, and remain awful and dangerous wharfs in that sea, to the great prejudice of many vessels wrecked thereon in times past, and almost weekly to this day: these rocks in some places project, in others level the surface of the sea; nevertheless they fathom, in their intervals, from eighteen to forty-eight feet water so that vessels have crossed these reefs on those intervals without touching. I have observed in my surveys of Martiers, that the Florida stream at its regular seasons, and uninterrupted course in fair weather, forms a remarkably visible glazed line of division, but in many places out of sight of any land; without which line the stream appears in some places as blue boiling water, in others bursting and fermenting like cataracts, even at times the greats calms, besides being fathomless in these very spots; and within the aforesaid line is an eddy quite smooth, changing gradually as it approaches Hawke channel and islands, from the stream’s deep blue, to a beautiful seagreen, and at last into a milk white. The soundings under the blue-coloured water are on fine white marl; under the sea-green, on the said marl, with spunge, white coral, sea-feathers, tortoise-grass, and sometimes banks of rocks; and under the white-coloured water, the soundings are on white marl, with banks of rocks, or white sand : this eddy takes its current in an opposite direction that of the contiguous stream, viz. south westwardly. The soundings in the eddy (N.B. in case no reef is in the way) between the stream and Hawke Channel run from two hundred and eighty to sixteen feet; and where reefs and shoals divide the stream and Hawke channel, the soundings in some places are, from bottomless, at once sixty-eight feet. After these discoveries, vessels may with safety avoid hereafter the eddy, or make allowance for it in their calculations; that is, if they cannot help falling into the eddy, (after they have taken all precautions by sounding in blue water, and, when they had bottom, stood off) they will naturally subtract what longitude they make in the eddy from what they made in the stream, and begin a new departure; be precise in their morning and meridian observations; and when they find themselves with 6 25′ east variation, in latitude 24, which is nearest Hueso island, the Somebreros, Loup Shoals, Holborn and Darthmouth inlets, they are to make an east offing of a hundred and forty miles: if with 7 30′ east variation, in latitude 24 40′, which is nearest Tabona, now Stephen Island, and Palmerston inlet; then try for an east offing of thirty miles before they stand north for the New Bahama channel: but in case they are with 6 east variation, in latitude 25 40′, which is nearest Cape Florida, and to the north of all reefs, they need no offing, provided they see no land to the westward. Many vessels, bound through the New Bahama channel, were lost in fair weather: unacquainted with the stream’s eddy, and of soundings being under blue water, they were swept indefensibly by the eddy to the westward; and when they found by their calculations that they had a good offing east of Cape Florida, stood north, and in lieu of entering the New Bahama channel, run strait upon a reef. As the meridian observations south of latitude 25 40′ are no direction, and the morning or evening observations useless, as long as the variations of the compass on the different places of the promontory have not been heretofore known; I have therefore, with the greatest care, taken the variations on Cape Florida, the Matance, and Hueso, by morning amplitudes, which on this promontory are surest; for the evening observations, as I have experienced both places where I could have both in one day and on one spot, do not so nearly agree with meridianal operation, (I make use of it at times which, though very tedious, is however infallible. I mentioned before what effect the different wings have upon the Florida stream. I think it necessary to observe now, that this stream is also subject to an alternation from another cause; by which, as well as by the winds, it is either pressed on or off the coast, viz. by the full and change of the moon, which, according to its position, has all the different effects upon the stream, however not in equal power with those of the winds; and the disposition of the stream is increased to its superlative, if the effects both of the winds and the moon are combined; for at this time natural zymosis of the ocean rises highest: this zymosis regulates the flood and ebb, and divides them in proportionate times, and consequently directs and increases them, with the assistance of easterly moons and winds, to the west, and, of westerly moons and winds, to the east; so that the west and east shores are at times deprived of, and at other times overflowed by tides, occasioned by these vicissitudes. The boisterous east, N.E. and north winds begin generally in September, and continue during the season when the sun is in the south, viz. until March, at which time these winds generally end with a gale or hurricane, if the moon’s full or change falls in with the season: if then vessels happen to be in the mouth of the Gulf of Mexico, that is, between the Havenna and Cape Florida, they had best endeavour to make the Bahama islands, or at last the soundings of them, and proceed under their lee side; but when they are to the north of them, to keep in the eastern extend of the stream, or else they will not be able to clear their way through the New Bahama channel, nor along the coast of East Florida : either go on shore of the reefs, Cape Florida, or Cape Canaveral; if not, upon the beach between both capes, or to the northward of them, which is the least evil of the two; for thus the crew and cargo may be saved and some vessels may also be brought off, provided the storm cases before the vessel is made a wreck of. But if, at the time of the south sun or at any other time, the winds are westwardly, then the Atlantic coast affords the most eligible lee for navigators who do not choose to take the stream. Two instances of the same nature I experienced, one in February, the other in December 1770, viz. December 25, then moon’s change: being in the Gulf stream, in the morning I made Fox, alias Rodrigos island, stood in for the Carysfort reef, fell in very soon (after I had sight of said island) with the stream’s eddy; and it was then, by the land, very visible how much I was swept to the south-westard by the eddy: at noon was opposite the Matance; in the evening almost lost sight of it: all this time I was becalmed till five o’clock in the evening: when the wind came from the north-wastward, I stood E.S.E. with which course I took my departure from the Matance (still a little visible) out of the eddy into the stream, run all night at the rate of five knots until four o’clock in the morning of the 26th, when the wind shifted to the east: sure of being twelve miles east of Cape Florida, besides allowing for current, I suffered my master, Mr. Charles Yonge, to lay the vessel N.N.E. for the New Bahama channel; about eleven discovered land, which by the meridian observation, as well as by approaching it nearer to sight, provide to be Cape Florida, which with a southwardly wind would have been an agreeable aspect: finding the Florida stream setting north-westwardly on shore, and on our weather-side, attempted to tack to the S.S.E but soon discovered that both wind and current hurried us towards the north end of Biskaina reef; stood N.N.E. again, but having upon both tacks wind and current joining on one side, was swept so near the land, that no more than a fifteen minutes run would have set a period to my navigation. My master ran to the helm, set the vessel about to the S.S.E. a second time, which however would only have determined our catastrophe upon the reef; whereas, on the other hand, the N.N.E tack would have brought us to the beach of the cape; for the main and reef bore N.N.E and S.S.W the vessel lay with its largest board tack parallel with the main: the current from the S.E. bearing upon the weather-quarter, afforded no room for lee-way between the vessel and main: and the vessel with her starboard tack, although the lay four points from the reef, because the current was setting upon the weather-bow, had the reef at the end of her lee-way; but that very instant the wind shifted to the E.N.E. which brought the stream in a narrower channel to the main and changed the N.W. into a N.N.W. current of course under the lee-bow of the vessel, besides laying fix points from the reef: was now able to obtain a sufficient offing, and gained the lee of the Bahamas. All that night, and ever after, until December 29, the wind waved between north and east, during which time I had much ado, by frequent south-east-wardly tacks, to regain the eastern extent of the stream in order to beware of Canaveral shoal and the coast of East Florida. I should not have enlarged there discoveries with the preceding particular narrative of my adventure, had I not thought it a circumstance which might serve the better to explain what observations and discoveries I have premised: besides, as I am determined at any time, (if it should be my lot to fall in with the above seasons in the sea) to make my offing good in the soundings of the Bahamas this obliges me to communicate my reasons and judgments in these critical cases to the world, for the benefit of those who are bound from the Havannah, in order to make Cape Florida and the mouth of the New Bahama channel. After this necessary digression, I return to the ancient state of the promontory, and the effect of the stream, by which the above mentioned river, now Grant’s terminating in Lloyd’s lake, is intirely filled up with the soil torn from both the main and northern peninsula; so that a passage north-eastward of the Matacombes, to communicate between the Martier islands, the main, and peninsula Larga, has not as yet been met with, for even a vessel of three feet draught. I was obliged to employee a battoe and yawl, of not above nine inches draught, to perform the survey thereof. The river between the two peninsulas, now Hawke channel, affords a very safe communication between the Martier reefs, shoals, and islands; as also a safe reception for vessels in drifters, finding their way through the inlets, which I will specify hereafter. This channel has upwards of forty-five feet water, and not less then 14 1/2 feet in the shallowest places, of which the first is opposite Elliot’s south and Jenyn’s north points, in latitude 25 degrees 18′-30′, and the second opposite the north point of Larga, in latitude 25 degrees 18′. Hawke channel has eight out and inlets, safe communications from the Florida stream, through the reefs and shoals, of no less than eighteen feet water; the first in latitude 25 degree 35′ 16″ N.W. from the south point of Biskaino island, called Keppel inlet; the second, called Buller, opposite Elliot, bears due east and west from and to reefs, bears due east and west from and to Tabona, now Stephen island, in latitude 24 degrees 42′ 30″, opposite the island Matance; the fifth, called Wallace, south of the sourthernmost of the Vacas Islands, and in the south end of Bonetta, reef, in latitude 24 degrees 32′ 32″; the sixth, called Liburne, S.E. of Edwards’s islands, in latitude 24 degrees 27′ 30″; the seventh, called Dartmouth, six miles and a half to the eastward of the Loup, S.b.E. of Robinson’s island, and E.b.S. of Huntindon’s harbour, in latitude 24 degree 27′ 16″; the eight and last, called Holburne inlet, is west of the Sombreros, and south of Egmonth channel, in latitude 24 degrees 20′. Besides these out or inlets, are three passages through the Martier islands into Richmond bay, for vessels of little draught to shorten their voyage to and from Pensacola: the northernmost, called Onflow, has its inlet on the south of Matacombe la Viega, in latitude 24 degrees 45′, opposite Spencer inlet, runs on the south of the islands Jenkinson, Dysons, Townshends, Coopers, and Bradshaws, (alias Sandy Key) and under the north of Vivera, has six feet water in the shallowest places: the next, Gordon, in latitude 24 degrees 35′, enters through the Vacas, viz. by the east and of the last westernmost but one, B.b.E. of Wallace inlet, runs north of Ellias, and its shallowest water is 8 1/2 feet: the third passage, called North, in latitude 24 degrees 33′ inlets east of Jennying island, N.b.E. of Dartmouth inlet, and W.b.N. of Litburne inlet, and runs on no less then six fee surroundings under the N.E. side of Newcastle island. 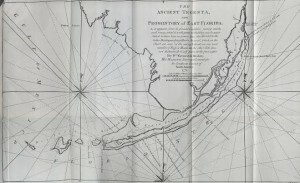 But vessels of eleven or twelve feet draught, taking Hawke channel, bound to or from Pensacola, or its contiguous places, must cross the Martier islands through the more southern passage, called Egmonth channel, of which I have advanced fully what was necessary: I will therefore conclude with the direction through Egmont channel. The south-westernmost point of Hueso is remarkable by the rocks thereon, mostly above water: vessels from the southward in the stream land in through Holburne inlet; as also vessels coming down Hawke channel, after clearing the said rocky point in Hueso, stand in the due north half a mile to the west of Hueso, and run up until they bring the said rocky point to bear S.S.E. a-stern, then lay N.N.W. and pursue that course until the shoals both of Hueso and Tortugas are cleared; from which time they will soon increase their water, as they advance in Richarmond bay: vessels again coming from the northward of the gulf may see the said rocky point, when within: 16 1/2 see surrounding before the Tortuga and Hueso banks draw up both sides of the channel, whence they bring the rocky point in a S. S. E. direction a-head, and follow that course (consulting eye and lead) until they shut up the two points of the first small bay on the north side of Hueso; then come to a safe anchor, or stand due south out through Holburne outlet into the stream, with which they will meet after hour knots run, provided they chuse the outside of the shoals and reefs of the Martiers; but in case they chuse the inside of the shoals and reefs through Hawke channel, then clear the rocky point with a south course of a full half-mile’s run, and draw up E.b.S along the south shores of the islands Hueso, Fitzherbert, &c. farther keeping an offing from the islands in general, of a league parallel to the range of them all, (consulting eye and lead) will meet with the best water to anchor every evening, and to proceed as far as Biskaino island, where without difficulty, if the wind is westerly or southerly, they may run into the Florida stream, which is there in sight. Before I conclude, I think it necessary to observe that flood and ebb keep equal tides upon the Atlantic coast as far south as Oswald, Laurence, Paradizos, Soldiers, Knox, and Pollock islands, where it floods seven hours and ebbs seven, after which it floods five hours and ebbs five: at the Matance island, or Spencer inlet, it never keeps any regularity; and so on as far as Hueso. Part of modern-day Amelia Island/Nassuau Village Area. Often referred to as the Gulf Breeze, can cause a variation in temperature in the coastal region of 10 degrees during the day and up to 15 degrees at night. Protection for the Indigo plant, plagued by caterpillars and drought, consisted of isolation of the inflected plants by way of making a trench around them to protect the other plants. De Brahm latter used his own knowledge to supply George Washington with 2 viles of disinfectant, said to ward off Yellow Fever. Said to be the area of water between the Florida Keys and the Bahamas, specifically Elbow Cay. Often referred to as Great Florida Reef, or The Florida Reef, it is the only reef in the continental United States. Area of shallow depths, famous for causing many ship wrecks. It is now marked by a lighthouse and is a popular spot for diving. Narrow silver of land connecting larger parts of land, flanked on both sides by water. Large body of water that now incorporates Card Sound, Barnes Sound, and the Whipray Basin. Near the modern-day Bal Harbor/Bay Harbor region of northern Miami. Hicoco plum, also called the Paradise Plum, found near beaches such as southern Florida. Opuntia, a type of cactus that is named after the Greek city Opus; commonly known as the Prickly Pear. Squilla: Mantis shrimp, marine crustaceans that commonly reach 12 inches in length. Nota bene (Latin), note well or take note. Maritime term meaning a more distant part of the sea in view. Evidences of shipwrecks are still visible today. This spot has become a very popular place for divers. Zymosis is a word lost in translation, but contributes to the fermentation and movement of the ocean according to tides and wind. Area of water situated between the Florida Keys and the southern coast of Florida.